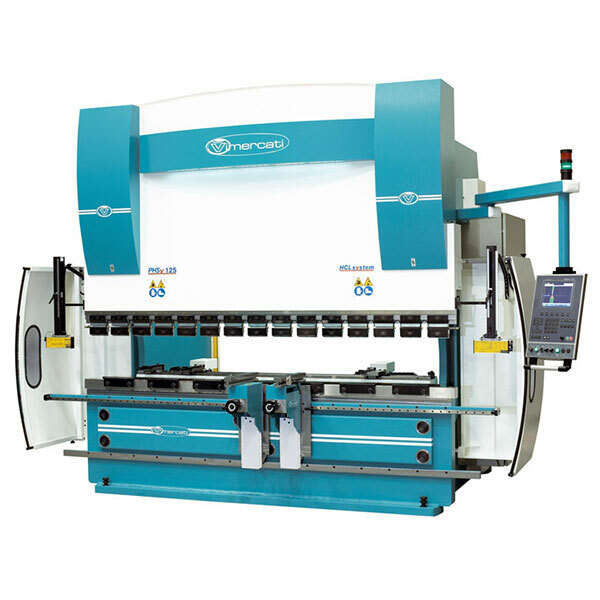 The product line of PHSY synchronised press brakes is characterized from its high operating speed, accuracy and reliability.The machine is manufactured with care in any single detail, from its high-rigidity main frame up to the punch-holders with double in- and outside sliding lines, and up to the high-resistance C45 forged steel cylinders. The hydraulic system is designed and manufactured by Fratelli Vimercati engineers using Bosch-Rexroth components. The oil-pressured pump by Bucher features high performance and extreme quietness. The electrical and electronic system, also designed and wired by Fratelli Vimercati engineers, is made with components supplied by leading manufacturing companies, such as Siemens, Pilz and Telemecanique. The product line of PHB press brakes with torsion bar features is characterized by high reliability, bending quality and usage ease. The control panel includes a PRG920 2-axis electronic programmer by Nuova Elettronica which enables the automatic setup of the Ram-travel down stroke height of axis Y (angle) and the positioning of the back motor-driven gauge X. Two-speed electrical motors with electrical brake provide to position the two axes. The control panel allows setting up the top dead centre, the speed change point and the operating pressure. These features allow higher speed and processing accuracy.